After the sunrise, we hit the road early from the Grand Canyon. 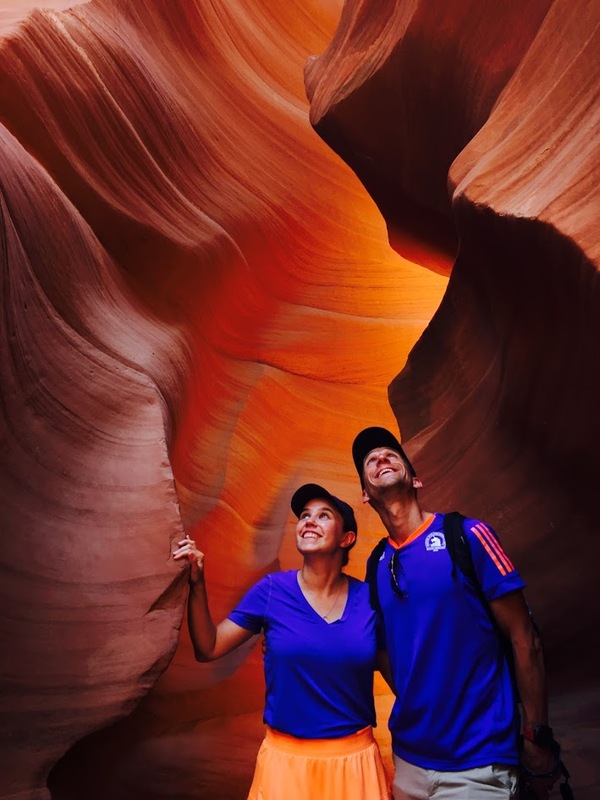 Our goal was to make it to the Lower Antelope Canyon by the afternoon followed by Monument Valley in the evening. The drive time was about 2 hours 3 minutes from the Grand Canyon to Antelope Canyon. Then an additional 2 hours to get to Monument Valley. The Lower Antelope Canyon is outside of Page Arizona but to get there you have to drive through the spectacular Marble Canyon. We wish we had more time to explore but we had to reserve tickets to Antelope Canyon at noon and didn’t want to miss the ticket time. Prior to arriving into Page we past Horseshoe Bend while coming into town. We decided to go get our tickets and come back to Horseshoe Bend. Even though our time was at noon. That is just the time to get into another line. We had to wait another 2 hours to get to the start of the Canyon. Yikes! Did I mention we were in over 100 degree heat. This is a very popular attraction and you only have two tour that you can select from Dixie Ellis or Ken’s Tours. We happened to go with Ken’s Tours. This land is on the reservation and owned by the same family. Dixie Ellis and Ken are brother and sister using the same canyon and standing in the same lines. Every group of about 10 people are paired with a guide and it is there job to keep you going through the canyon together. It is like herding cats. Truly! Our guide loved to talk and told us all about the canyon during our two hour wait. Telling us how they have escape ladders due to flash floods and how people have died due to the flash floods. Also about limited about of work on the reservation and the “good jobs” and the ugly power plant painfully distorting the landscape. While the tourist might see the power plant as a eye sore they see it as income and jobs. Allow them to live on the reservation. After our two hour wait we made it to the front of the line and climbed down the ladder into Antelope Canyon. Really it is worth the wait. It was amazing I should just let you look at the pictures because the tell the story. After about an hour walking through the cool Canyon we headed back up to into heat. If you ever have the opportunity to go do it. You won’t regret it. Next we backtrack a little to see Horseshoe Bend. I thought it was going to right over the hill but it is a further walk that we anticipated. The heat was unbearable now the afternoon heat but the view was again incredible and worth the hike in the full sun. Next we drove another two hours to arrive in Monument Valley. There are limited places to stay in Monument Valley you only have two options: The View or Goulding’s Lodge. The View is more expensive and located on the reservation but with an amazing view. Goulding’s Lodge is off the reservation but has more spacious rooms with kitchens. We decided to stay at Goulding’s lodge. One thing to remember is that you have to pay to get on the reservation. This is not included in your National Park Pass. The fee is $20. We arrived checked into our hotel and headed to the Valley. We checked out the spectacular view and then drove down into the Valley they recommend not driving your rental car BUT we did. They also offer open trucks to drive into the valley but this look miserable due to the dusty wind and the heat. While the drive was a little nerve racking for me. Mr Travelista was having a ball. His motto was nothing parties like a rental. Yikes!! You can drive up to all the sights park and take pictures. We even saw wild horses. It was spectacular. We headed back to the lodge to watch the sunset over Monument Valley and heading back to our hotel. We finished the day by exploring the small grocery store near Goulding’s lodge. Then made our dinner and ate on the porch. Then next day we headed to Moab Utah to explore Arches National Park and Canyonland. Stay tuned.